Should All Weapons Do 1d6 Damage? For the fun of it I thought I’d dissect the arguments for the OD&D pre-Greyhawk/Holmes Basic/S&W Whitebox convention that all weapons should do 1d6 damage. For each argument, I’ll make the positive claim and then offer a critique in the next post. We’ll see where we end up. Should all weapons do 1d6 damage? Why not? Combat is abstract. In a certain sense all weapons do the same damage in the end. Being fatally stabbed by a dagger is just as bad as being fatally stabbed by a two-handed sword. Rolling different kinds of dice (as well as different numbers of dice) for each weapon distracts from the “ballet of combat”. Having all weapons do 1d6 focuses attention on the combat not on the dice. Having some weapons do more than 1d6 damage introduces an annoying sort of inflation into the game. If, for example, the damage done by a two-handed sword is increased from 1d6 in Men & Magic to 3d6 damage in Greyhawk (at least against large creatures), then to be fair (or rather, in the interests of realism or consistency), many of those large creatures must have their damage increased as well. Having all weapons do 1d6 damage introduces more diversity in the choice of weapons. From the point of view of fantasy role-playing, this is a good thing. If weapons do different amounts of damage, players will gravitate to only a few of them--those that do the most damage. That’s a bad thing. Having all weapons do 1d6 damage allows you to come up with other reasons (more fun and more realistic) to choose some weapons over others—some weapons you can charge with, others might be better at piercing armor, etc. This is healthy. It’s a feature of the original game. How could Gygax and Holmes have been wrong? Am I leaving any out? Weapons break. Battlefields are littered with broken weapons as well as broken bodies. In my view, most breaks should be essentially random—the result of a critical miss, or some such—or should (sometimes) be the result of a successful kill—ramming that sword into the dragon’s belly was forceful enough to kill it, but also forceful enough to break the sword. But some breaks are the result of intentional actions in combat using weapons designed to break other weapons. In my game this would cover larger members of the axe family—the military axe, battle axe and halberd as well as the two-handed sword. The base to break a weapon is 16 (as opposed to the 11 of disarm). Only average to large axes and the two-handed sword can be used to break a weapon. Defending with a two-handed weapon gets no modifier. I’m still working on a chart for random weapon breakage that’s both realistic seeming and simple. You want a rapier to have a much greater chance of breaking than a mace, but you want to use the existing stats (weight? length? the damage roll?) to simulate that. You don’t want some extra number—breakability or whatever—fussing things up. The armor of the defender should also be a factor. If you're attacking a guy in plate armor with your rapier, there's a much greater chance you'll break the point. And again there’s that balance question. You don’t want weapons breaking all the time, but you do want them to break often enough to be something that should be factored into the give and take of play (as opposed to a totally rare and obscure random event). So does that mean that breaks should on average occur in, say, 1 out of 100 attack rolls? 1 out of 500? 1 out of 1,000? I’m not sure I know the answer to that. As with any rules set, you want something that will appear realistic without being too complicated. The particular problem with creating a disarm mechanic, or any mechanic that deals with special combat tactics or maneuvers, is you want to create options that can be attractive and useful (and thus meaningful) but not so attractive and useful that they completely disrupt or unbalance the general combat mechanic. After a successful hit, but before rolling damage, the attacker may elect to try to disarm his opponent. If the defender is fighting with two weapons, the attacker may choose which weapon to target. In my view systems that require maneuvers to be declared before rolling to hit add an extra level of unnecessary fussing. In addition, many if not most “hits” in D&D are not actual weapon strikes but rather successful attempts at getting the advantage of the defender or wearing him down. Thus, it seems appropriate that a disarm attempt would follow a hit rather than preceding it. One might object, I suppose, that the fact that someone is wearing, say, plate armor shouldn’t make it easier to potentially disarm him. I would say three things in response: 1. Combat in D&D is abstract. That someone is wearing plate, makes them less vulnerable to actual strikes but also perhaps makes them more potentially effective at stopping their opponent from doing various things—their armor means they don’t have to worry as much about, say, using their arm to block a blow (or block a successful disarm). 2. I’m not sure I want a disarm mechanic that would make disarming the guy in plate armor the default attack (since its tough to get at him any other way). It might be that this would be somewhat realistic, but I think it would change the general combat mechanic in a bad way. 3. It’s simpler. -1 for every 3 hit points of the defender (what he has remaining, not his total). This tracks two things: It’s harder to disarm powerful characters. It’s easier to disarm anyone when they are fatigued. The hit dice (though not hit points) of the attacker are taken into account in the initial to hit roll. Again, the -3 is based on the “pre-inflationary” original three-booklets. If one is using a Greyhawk, Classic or AD&D sort of mechanic, one could make it -1 for every 5 hit points. +/- 1 for the difference in weight between the attacker’s weapon versus the defender’s weapon. Given the weapon weights in my game, this is not as potentially radical a modifier as it might seem. In my view, the weapon weights in all versions of D&D are too high. 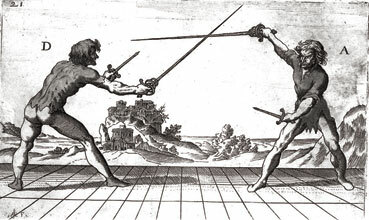 For example, a two-handed sword is pegged at 15 lb. in Men & Magic and 25 lb. in 1st Edition AD&D. A halberd is pegged at 15 lb. and 17½ lb., a longsword at 5 lb. and 6 lb. But I would make these weights much lower—8 lb. for the two-handed sword, 7 lb. for the halberd and 3 lb. for the longsword. I believe this is more historically accurate. See the excellent What Did Historical Swords Weigh? at the excellent ARMA site. Or go to your local Target, buy a 25 lb. container of cat litter and imagine yourself effectively wielding something that heavy. +4 if the attacker is wielding a weapon that is designed to be effective at disarming. In my setting this would include the black-bill and forest bill—polearms with all sorts of nasty hooks and curves on their blades. -4 if the defender is wielding a two-handed weapon. If the disarm is successful, the weapon will fly in a random (1d12) direction and land 1d20 feet away. Any thoughts on this? Does it get the balance right? Two-handed weapon: No combat bonuses or penalties. One-handed weapon and buckler: No combat bonuses or penalties per se, though the buckler will confer an additional armor point if you are not wearing plate armor or a breastplate. One-handed weapon and parrying item: Permissible parrying items include a cape, a leather gauntlet, a torch or a cloth hat. (The latter only counts if opposing a dagger or rapier.) Impermissible parrying items include a lantern or a pistol. Permissible parrying items confer no combat bonuses or penalties. One-handed weapon and second weapon: If you are wielding an average or larger weapon (3 ft or longer in length) the second weapon cannot be longer than ⅔ the length of the main weapon. Otherwise it can be up to the same length. (Thus you can fight with a backsword and a ballock knife, or two ballock knives but not two backswords.) On any natural roll of 7, the second weapon will do 1d3 of damage (whatever the usual damage of the weapon). If this roll was a hit, then the damage will be in addition to the damage of the main weapon. Case of rapiers: Fighting with two rapiers gives you a penalty of -2 to hit but improves your armor class by 2. One-handed weapon only: If none of the above conditions apply, but your opponent does satisfy one of them, then he will be at +1 to hit. The reverse also applies, of course. "Do not Smite!" "Smite!" "Do not Smite!" The first and third of those phrases were the last words of Snorri Sturluson, the great medieval Icelandic poet, Saga writer, lawyer, historian and political leader. If you go to Iceland (which I strongly recommend), you will find few surviving buildings from before WW2. This is because Iceland was an extremely poor country from the 13th-century to the first half of the 20th, exploited by it's Scandinavian brothers--Norway, Sweden and Denmark--on an almost continuous basis for 700 years. Mud and wood shacks don't last. But most of the the natural locations described in the great Sagas of Iceland's Golden Age still survive--the great plain of Thingvellir where the refined farmer-vikings of the 12th and 13th centuries used to meet at the Althing once a year to pursue their intricate lawsuits, the lonely and foreboding isle of Drangey where the misunderstood and wronged Grettir made his last stand, abandoned by his friends, and Snorri Sturluson's property where he also made a last stand against the assassins (70 in total) sent to kill him. They found him in the cellar. The appropriately named Arni the Bitter raised his weapon . . .
"Do not smite", said Snorri. "Smite", said one of Arni's companions. That's the pool where he bathed and there's the entrance to that cellar. Once you hear that sequence of words they are impossible to forget. D&D Unplugged: A Golden Age? In his seminal old school Musings, Philotomy Jurament makes a strong case for why one should consider playing OD&D with only the three original 1974 booklets (plus the appropriate house rules, of course)—that is, D&D pre-Greyhawk, where all weapons do 1d6 damage (though Philotomy advocates tweaking this a little bit), ability scores have few explicit modifiers on combat, player characters and monsters use only a 1d6 for hit dice, and so on. Matthew Finch’s Swords and Wizardry White Box and some of the White Box spin-offs like Ruins and Ronin track the same mechanic. We might call it D&D Unplugged. I find it very attractive. A psychologist might say it satisfies my deep-seated bias towards minimalism or fundamentalism or whatever. I don’t know. And I’m not going to argue for the approach here. What I am interested in is how well it comports with the actual history of the game. Many people in the OSR are trying to recapture their first experiences with the game. I’m 48 and started playing when I was 15. That was the spring of 1979, I think. We played using the AD&D Monster Manual, Player’s Handbook and various bit and pieces such as the Judges Guild Ready Ref Sheets and the Dungeon Master’s Guide “official” preview charts in Dragon Magazine. As I recall, publication of the Guide was still a few months down the road while the original three-booklet box set and supplements were sold-out and hard to find. There was the Holmes Basic Set, which in some ways was a cleaned up version of the three original booklets, but everyone I knew thought it was for babies. It was what your kid-brother played with, or whatever. Even then, though the game was growing by leaps and bounds, the market was still only 10%, or so I would estimate, of what it would become a few years later. Things were still quite small. Back issues of Dragon magazine from a few months before had a feature called “Mapping the Dungeons” where any Dungeon Master could get their name and address published in the magazine—there were something like eight DM’s in all of Massachusetts, and so on. Many of the classic modules had not yet been written and Judges Guild had just published the first (and at that point only) city adventure. Those who advocate D&D unplugged want us to go back five years before that to (I guess) the spring of 1974. Now, if the three original booklets are to be the standard, they only lasted in their unmodified form for one year. The first supplement, Greyhawk, would come out in the spring of 1975. This was before the first issue of Dragon Magazine and roughly simultaneous with the first issue of its predecessor The Strategic Review. Now, Greyhawk would lay the framework for AD&D, and so (the hard-core purists might say) it was the beginning of the end in so far as it introduced Thieves, Paladins and all sorts of foofy inflationary elements like two-handed swords doing 3d6 damage and monsters with three attack routines. Yet as far as I can tell from looking at the original sources, no one treated Greyhawk as heretical. Rather it was regarded as a natural and perhaps even necessary improvement on the original game. And again, it needs to be stressed—Greyhawk only came out one year after the first publication of the original booklets. The number of people playing Dungeons and Dragons at that time was very small. So the question is, suppose its true that pre-supplement D&D really is preferable or superior in certain fundamental ways (as I think it might be). If so, then it tracks a golden age that never existed. Or at least if that golden age existed, it lasted for no more that a year for a very small group of people, few or none of whom (if the sources can be trusted) understanding it for what it was and who would thus go on to embrace the end of it when it came. I find this fascinating and odd. What this shows, among other things is that under what we might call the virtual point swapping scheme, it’s pretty darn difficult to get a set of scores that will produce experience penalties, and conversely it is not very difficult to get a set of scores that will produce bonuses. This is due to the fact that even with a low "raw" prime requisite score, the odds are that you'll be saved by one or more bonuses from your secondary or tertiary scores. So if you know you want to play a particular class, there's a 30-40% chance you will roll up scores that will give you at least a small experience bonus and a 70-80% chance that you will avoid any experience penalty. But if you are prepared to play any of the four classes, then the odds of rolling up a character who gets the highest experience bonus of +10% are better than even, and the odds of rolling up a “hopeless” character who will suffer a penalty are extremely low—about 1 in 500 for the -10% penalty and 1 in 30,000 for the -20% penalty!!! Who said rolling 3d6 in order was such a bad deal? Why Can't Xylarthen be a Fighter II? Why Can't Xylarthen be a Fighter I?